All of these recipes can be mixed with the dry ingredients and stored back. Wet ingredients (i.e. oil, butter, shortening, Vanilla, Eggs and water) would be added prior to baking. See the blog link for the actual recipe! #1 The Best Brownie Mix by Crazy for Crust. This bloggers gives a lot of detail on her website about using the recipe and provides 5 more Brownie variations using this mix (i.e. Reeses Brownies with Oreo Crust, PB&J Brownies, Cookies and Creams Brownie Bites, One Bowl Brownies with Almond Joy, and Nutter Butter Truffle Brownies). #2 Homemade Brownie Mix by Raining Hot Coupons. As you can see #1 and #2 are pretty much the same recipe except #2 has more cocoa. BTW this website has a ton of ads. It’s the primary reason I won’t return to the blog no matter what the information is. 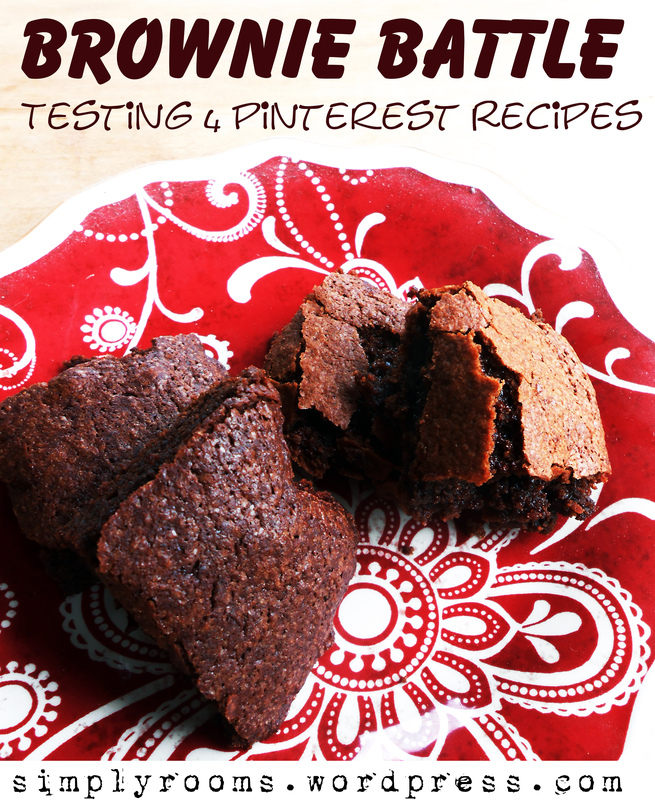 #3 Brownie Mix Recipe by Creative Homemaking. This recipe increases flour, vanilla, baking powder and water but decreases cocoa. Probably the increase of vanilla, baking powder and water is due to the increase of flour. #4 Homemade Brownie Mix by Chef in Training. This recipe is probably pretty delish but I decided to pass since it uses vegetable shortening, which I rarely keep on hand in my pantry (usually only at Christmas when doing holiday baking). It’s interesting that this recipe has an increase in flour and sugar but decreases cocoa (the smallest amount in comparison with the other recipes). This recipe would also have the highest amount of calories due to the fat and sugar numbers. Just analyzing the ingredients, I tried #1 and #3. Both had the same brand of flours, sugar, cocoa, etc…, baked in similar pans, and in the same oven. We tried them side by side so we could see and taste the difference immediately. Wow! I expected #1 to be well, number one, but #3 was the clear winner of all four of us samplers. #1 had a more cake taste (Brownie on the left in photo). Honestly, it tasted like a cupcake not a brownie. It didn’t rise well and the color was a bit less Brownie-like. The fat used in this recipe was melted butter – it might work better with oil, which the second recipe used. #3 Brownie Mix Recipe by Creative Homemaking had that crust that Brownies get (you can clearly see it in the photos – it’s the Brownie on the right) which makes them appealing. Even though the recipe had less cocoa it still had a rich chocolate fudge taste you get with brownies. It also had a more pleasing aftertaste – maybe that was due to the increase of vanilla…? Whatever the reason, #3 was a clear winner for our family!